Los Angeles has a reputation of setting trends in the technology world. From new laptops and cell phones to higher computing power, Los Angeles is always ahead of the curve. However, constantly replacing structures and systems that have been in place for a couple of years is not financially feasible, especially considering the recessed economy. In place of designing and building new data centers, which can take months or years and cost a company a fair amount of profit, Los Angeles companies are looking toward data center maintenance to keep up to date with security, computing power, and management of servers. Of course, updating an entire system creates downtime, and downtime impedes a company from working at their highest potential. In order to decrease the amount of downtime a data center has to undertake while still remaining functional, many businesses are looking for Los Angeles data center maintenance companies. These companies provide services that can focus on one or two aspects of data center maintenance, help to diagnose problems or fix security breaches, and even overhaul the systems in a data center. Through these Los Angeles data center maintenance services, companies can still function as highly as possible without suffering from lost computing power. 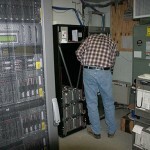 Some of the specific services that Los Angeles data center maintenance teams perform focus on the function of servers. One of the worst ways in which a company cannot relate data either to their employees or their customers is when a server shuts down. These problems can wipe out the function of websites, lost data or other info, and open a company up for security problems. Whether needing to replace or repair hardware, these data center maintenance companies look to see what types of systems a company uses, where the problem area has arisen, and how quickly that problem can be fixed. Many even deliver the hardware to a company rather than making a company wait for a part to ship. Other specific services include storage support, support for an operating system, and warranty tracking. Though some of these services can be taken care of through a company’s IT department, they are still available through data center maintenance companies in instances where backup or extra help is needed. For those data centers that simply need some parts replaced or updated, data center maintenance companies can provide local and helpful service. They can help to shut a data center down, relocate it, or provide safe shut downs. If a company is simply looking to relocate a data center, these data center maintenance companies can also help to map out and plan a good location for a future or replacement spot for a data center. Through these processes, a business or company can more easily stay within maintenance budgets, effectively plan ahead for problems that may arise with data centers, and keep their computing levels as high and efficient as possible. Through these services, even data centers that have been in place for several years can simply be updated rather than completely replaced, saving a company invaluable time, money, and possibilities. In this way, Los Angeles companies can continue to live up to their ahead-of-the-times reputation and improve the quality of their storage and computing power. This entry was posted in data center maintenance and tagged data center maintenance, Los Angeles Data Center Contructions, Los Angeles Data Center Maintenance. Bookmark the permalink.